For centuries, algae, the oldest plants on earth, offer a broad range of products and benefits in the fields nutrition and alimentation, health and wellness, thalassotherapy, pharmaceuticals and cosmetics. But turning seaweeds into art is a challenge for crafters, decorators and artists. Results are shown here as decorative and educational elements. Green, brown and red seaweeds offer a marine festival of natural forms and colors. Alga-Net introduces you to the unknown seaweed art through Marta Bellocq's exclusive works: bookmarks, giveaways, scientific pressings, herbarium, vintage compositions made with more than one hundred different species of seaweeds, collected from coasts around the world . Every work is different and constitutes an original model. 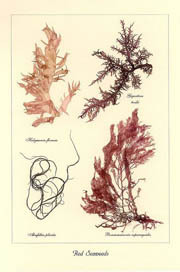 The design will be variable even if the same species of seaweed are used. Colors, forms and sizes depend on season, coast type, water temperature and sun exposure. On request, we elaborate any budget for collage art works decoration. Promotional gifts can be personalized. Please do not hesitate to ask for wholesale price. 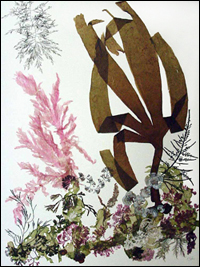 See available seaweed pressing artworks.